great topics and great guests. only complaint is that sometimes the intro segment seems to go on forever (we don't need to know -everything- about the guest). I really appreciate that Mr. Cobb asks good questions - but then backs off and lets the guests express themselves. if you're interested in accelerating change, transhumanism / the singularity - or less-exotic aspects of the future - I'd check out this podcast. This is a very cool podcast. i recently discovered it and have been downloading all back episodes. The interviews are excellent, I am amazed at the quality of the roster -- some of my favorite SciFi authors are on the list. Each episode also contains a chapter from the author's novel "Bones Burnt Black" read by the author himself. I really enjoy the variety and richness of the content. The novel serialization is a nice addition and keeps me downloading new episodes. This is a great podcast where the host talks with various people (mostly in the field of Science Fiction) about issues related to the future. Many of the subjects are fascinating and educational. The earlier shows were probably too long (over two hours), but the host has recently modified the show so that they are now about a hour long. All in all, a terrific offering for people who enjoy intellectual discussion and debate. Continued Bright Future for the Show? 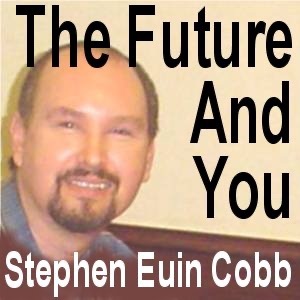 Stephen has done a great job of producing a creative, entertaining, informative show regarding what our future may...or may not look like. A different guest each week gives unique and intelligent answers to where humanity and the rest of creation could be heading. From space travel, medicine, singularity, second life, and entertainment, if you are interested at all about the near or far flung future, this is a great show to tune in to. This podcast has good content and delivery but it is just too long. This thing needs to be broken into multiples of no more than 45 minutes max. A 2.5 hour podcast is just unlistenable. i love it, its interesting and good. ive even been on his podcast its intriging and theres never a dull moment. His book is also excellent.